Glacier Bay, Alaska. How incredibly beautiful is that?! So I’m starting to see the beauty in blogging ahead. It took a lot of prep before I left for my amazing trip, but having the posts just quietly post by themselves was really fantastic. Though, it’s pretty difficult to be spontaneous and talk about what’s happening now when planning ahead, and that’s kinda the thing here, so there’s that. Still, it’s good to keep in mind for future reference. And speaking of beauty, how gorgeous was Glacier Bay? It was difficult to believe it was July, it was coat and hat and gloves weather. Sweet, clean air with that edge of coolness to it. Refreshing, inside and out. 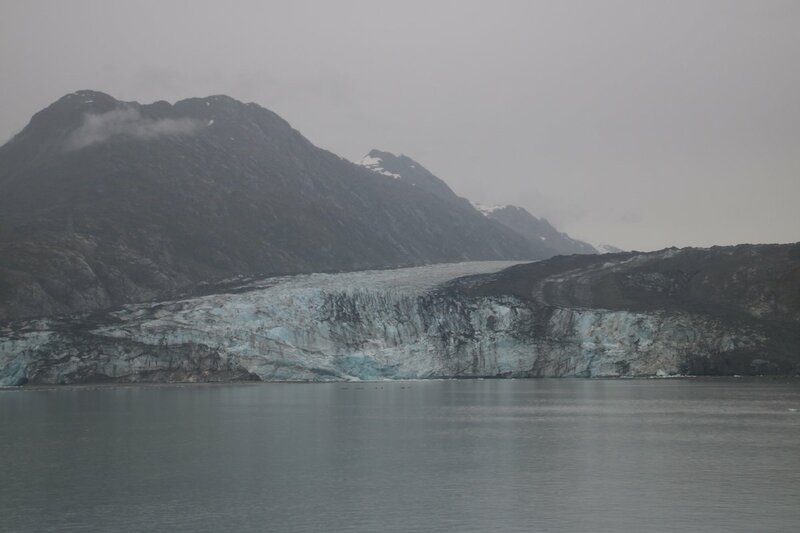 We couldn’t get off the boat in Glacier Bay, and it was tough to see just how big these glaciers are. 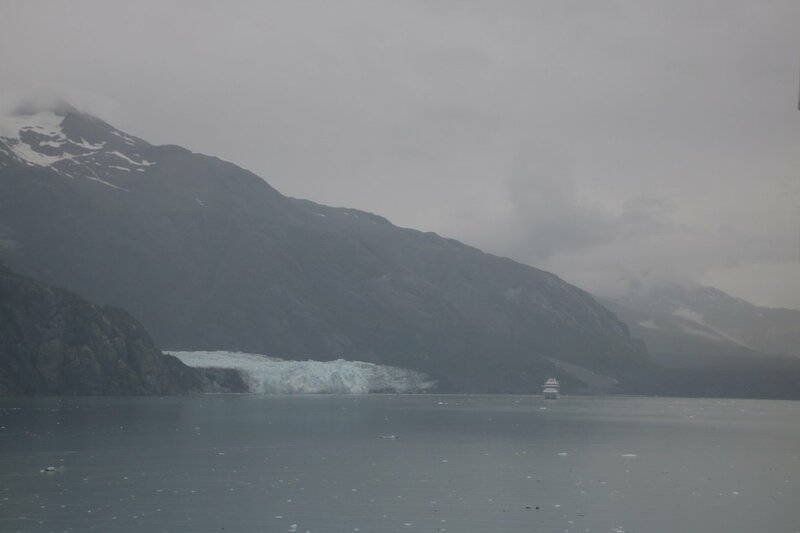 Here’s a picture with a cruise ship for scale; I’m not sure it’s the same glacier, I’d have to do some forensic time matching, as the pic above is from my phone. Which is an excellent wide-angle lens. I think it’s the same one. Scale is something I had much time to think about way out there, where everything is huge and we are so tiny. Where even an enormous cruise ship looks like a dot. Where you can’t judge the distance, and all you can do is take in the view. Things can feel smaller than they are; things can feel larger than they are; and all of that is relative to something else entirely. Usually us. See what I mean? Would you believe me if I told you there were kayakers in that shot? So I guess what I’m saying is sometimes things really are the glacier. Sometimes they’re the cruise ship. But mostly, almost always, they’re the kayakers. Oh, Monday. And NaNoWriMo. And Other Assorted Bits. It’s taking up storage room here, so I figured, hey, why not use it. Last year’s fall colors. So I thought I had the most genius solution to my storage problem: Instagram. Oh yes, thought I in my too-old-for-the-app naivety, Instagram will solve my problems and give me another social media outlet! Well. Turns out the only pictures you can upload on Instagram are from your phone. And just give WordPress more money. I mean they’re totally counting on it, right?! Ironically, though, I had to use Flickr to embed that photo, because I couldn’t do it directly from Canva for some reason, which is where I made it. And by “made it” I mean typed those words. Proof of my Monday: I literally hit “publish” when I meant to save a draft. SAVE A DRAFT. Still working on this post, I’ll update it when it’s finished. ANYWHO, (hmm, was that a little channeling of Aunty Ida?) The balloon drops on NaNoWriMo tomorrow, and I think I’m jumping in. Last year, for the first time since I started doing NaNoWriMo, I didn’t hit 50,000. So I don’t know if I’m starting with a chip on my shoulder or a monkey on my back. I can’t decide if a monkey on my back might be fun. We could become best friends and solve crimes together! On a completely unrelated note, I think I know what I’m writing about for NaNoWriMo. This photo comes from NectarConsulting.Com. I have absolutely no idea why, or if they made it. But I’m pretty sure that’s no a monkey, but a baboon. I’m hoping to have the next Galapagos post up, uhh, someday. Meanwhile, if you don’t hear from me, the technology has gotten me. Please send help and chocolate cupcakes. Heavy on the chocolate cupcakes. Look at this guy, taking up storage space. Aw, just kidding! Can’t get mad at him! Arggh. So if you read yesterday’s post, you know that I have reached my media storage limit here. I’ve been trying to get Flickr to play nice, but I’m having trouble, and I’ll have to go through the photos before I upload. For Day 3 of the trip alone — the first full day in the Galapagos — I have over 1200 photos. I really took that many photos. So I have to weed through them, and then, if I use Flickr, select them one by one. Or post an album, but apparently I can’t embed it. Yes, I know, this dilemma is fascinating. The easiest option is the most expensive. Isn’t that always the case? I can buy more storage from WordPress, but I’m just not sure how I feel about that. So trip posts will have to wait while I see if I can get the the whole Flickr thing going (or if anyone else knows of a better photo hosting site, I’m all ears! Well, not ALL ears. 86% ears). Or I could just invite you all over and make you watch my slides, hour upon hour, blithely refilling glasses with tepid water, as I explain the rocks. Yes, even the rocks are interesting on the Galapagos. Beyond that, last show on Saturday! It’s now or never, get your tickets!